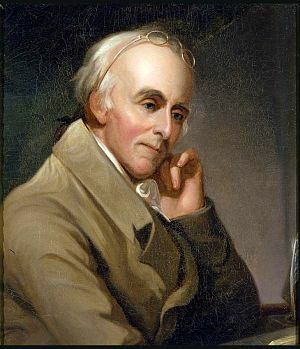 Benjamin Rush (1746 - 1813) was an American physician and signatory of the Declaration of Independence. Powell describes Rush as "a ready victim of every trap self-discretion could lay" who found security in the good opinion of others. He kept his theory of treatment and ignored the facts. "He recognized no error except in others." He also created "Rush's Thunderbolts", which aside from an awesome name for a band, were an olde-timey "cure" for syphilis. The pills were in fact a potent laxative made from mercurial compounds and jalap root. Though he was an abolitionist, Rush believed in "scientific" racialism, and that blacks suffered from a disease called "negritude", which could be cured by becoming white. For quite a long time, the official seal of the American Psychiatric Association featured a profile of Rush due to his influential work on what he called "diseases of the mind". He was a proponent of the idea that mental illnesses are real as opposed to mental illness denial and believed they had a biological component, though his ideas were pretty far off about what exactly this was (he blamed abnormal circulation and humoural imbalances). He also had a prominent role in the reform of mental asylums and pioneered the disease model of addictions rather than seeing them as a moral failing. Perhaps due to his mixed legacy, the APA recently adopted a new logo which features a stylized brain with the Rod of Asclepius (the symbol of medicine that you've seen on ambulances and such). This is arguably unfair; Rush, like all people, was a product of his time, and while he held views that today are objectionable, what needs to be evaluated is not how good he was in comparison to ourselves but how much better he made society. ↑ Brown, David E. (6 June 1999). "What They Carried". New York Times. ↑ In Our Own Voices: African American Stories of Oppression, Survival and Recovery in the Mental Health System, Vanessa Jackson. Medical inquiries and observations, volume 4, which contains the full text of his Defence of Blood-letting as a Remedy for Certain Diseases. In PDF format. A Defence of Blood-letting, as a Remedy for Certain Diseases, an incomplete transcription, but it's in HTML format and easier to view. This page was last modified on 19 February 2018, at 18:13.